Mourinho rages against UEFA. Again. Jose Mourinho's persecution complex is still very much in evidence. The Chelsea manager may claim to have mellowed but he railed furiously against UEFA after Chelsea were beaten on penalties by Bayern Munich in the final of the Super Cup. Chelsea had been reduced to ten men when Ramires was sent off with the score at 1-1. They still came within seconds of winning the trophy, leading 2-1 in extra time until Bayern equalised in the dying seconds. 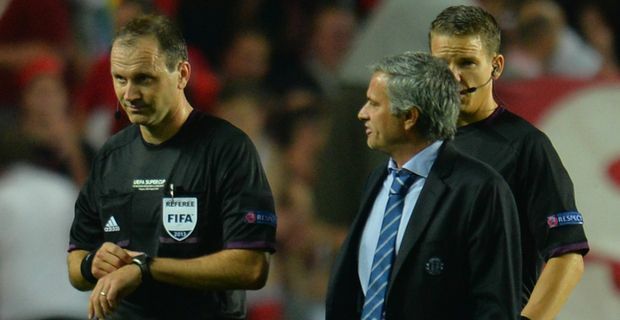 Chelsea lost the shoot-out, but Mourinho said that the red card had changed the match. "A good English referee would have stopped the game and told Ramires: 'Look, you've not hurt anyone but you mustn't do that again,'" Mourinho said. "Or tell the Bayern players: 'Don't dive. Don't try and provoke. Play a fair game.' If you are in love with football, you don't kill a final with a second yellow card like this. You don't kill the final." Mourinho pointed out that he has a habit of managing teams reduced to 10 men in UEFA matches. "I played two or three times with 10 men against Barça. I went to Inter and played a Champions League semi-final, one hour, with 10 men against Barcelona. I go to Real Madrid, I played again a Champions League semi-final with 10 men. Now I come back to Chelsea and played a Super Cup final with 10 men again. Analyse the actions and make your conclusions. I'm unlucky. Just that." At least the experience stood him in good stead. After Ramires's dismissal, Chelsea still looked dangerous. "In the end of the game, with everybody absolutely tired, they gave absolutely everything," the manager said. "I think my experience of playing with 10 men gave us a hand." Chelsea came back without the cup, but at least they know that their manager is still burning with the old passion and sense of grievance.